What you are asking for is included in core Views, unless I am mistaken. In a new Content view you will be able to add a "Content: Node operations bulk form" field and that offers you an option for "Save content". // Get an array of all 'page' node IDs. // Load all the nodes. Problem with this, of course, is you can reach your memory limit pretty fast when re-saving many thousands of nodes that way. So you have to implement a batch process. Thankfully hook_update_N(&$sandbox) already has this capability built-in. Follow the link for sample code. If running your update all at once could possibly cause PHP to time out, use the $sandbox parameter to indicate that the Batch API should be used for your update. In this case, your update function acts as an implementation of callback_batch_operation(), and $sandbox acts as the batch context parameter. In your function, read the state information from the previous run from $sandbox (or initialize), run a chunk of updates, save the state in $sandbox, and set $sandbox['#finished'] to a value between 0 and 1 to indicate the percent completed, or 1 if it is finished (you need to do this explicitly in each pass). 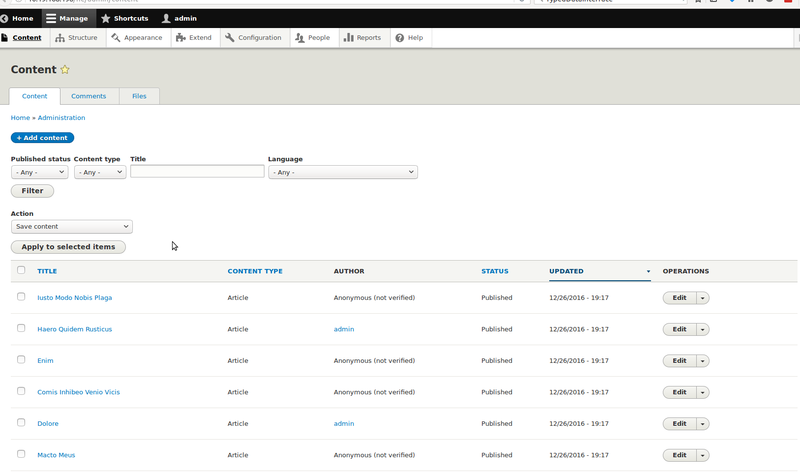 In Drupal 8, there is a module Scheduler which gives content editors the ability to schedule nodes to be published and unpublished at specified dates and times in the future. 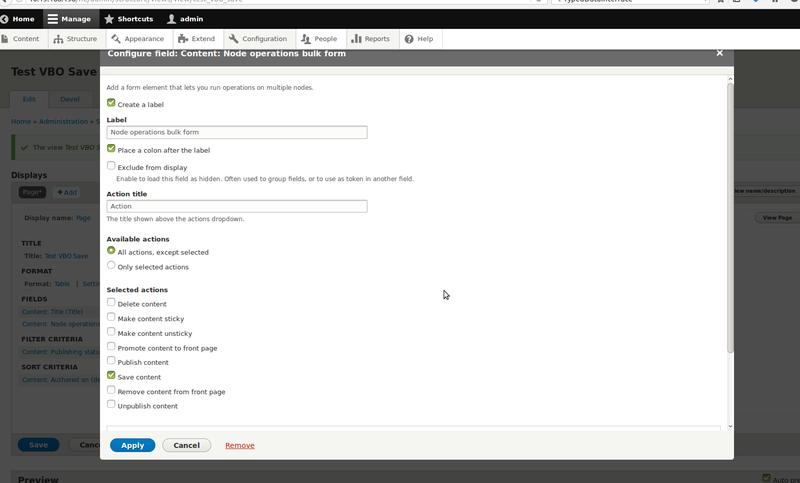 It's currently in alpha version for drupal 8. Not the answer you're looking for? Browse other questions tagged 8 views-bulk-operations or ask your own question. How can I simplify the use of flags with Views Bulk Operations? How do I Bulk Edit Fields or Taxonomy of Nodes? Adding theme settings via module?